Since Spring is upon us, Shiner has been thinking of ways that she can spruce up her wardrobe for the new season. We live in Texas, so most clothes are out of the question for the warmer months here. Plus, it's kind of hard to find clothes that fit her anyways. That leaves us with dog collars. 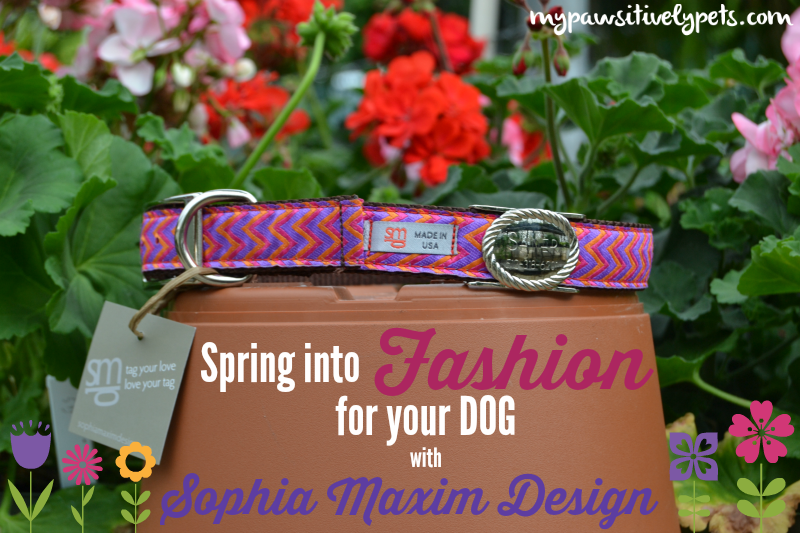 We were recently asked to review a collar by Sophia Maxim Design and just in time for Spring too. After looking through all the options on the Sophia Maxim Design website, Shiner and I choose a brightly colored and feminine looking collar that would match her fur. 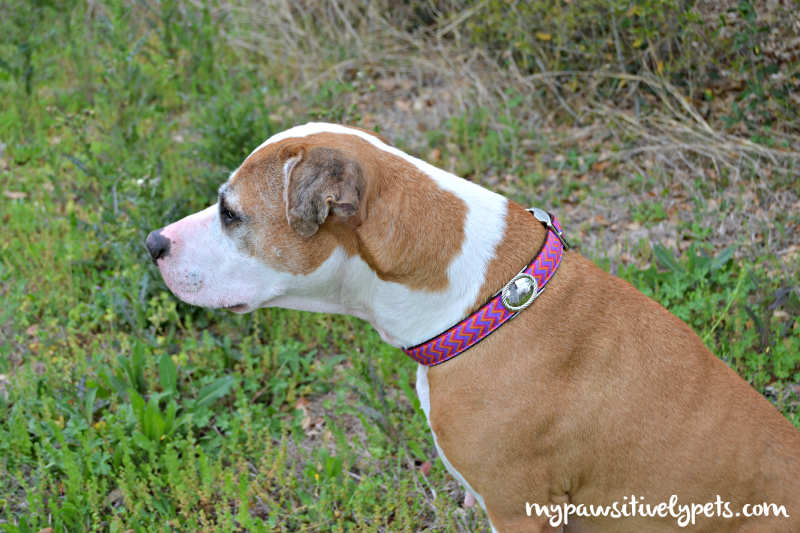 I love the colors on this dog collar - purple, pink, and orange. The colors are girly and the orange compliments Shiner's orange-colored fur well. This particular pattern is named "Amalfi Sunrise" in case anyone wants to know. It's part of the "Everyday Collection" at Sophia Maxim Design. Don't worry boy doggies - there is also a nice selection for you at Sophia Maxim Design. They have a dog collar just like Shiner's, only it comes in blue, brown, and white. Sophia Maxim Design also offers leashes and custom jewelry dog tags. Their dog tags aren't the kind that hang down from a collar. They go right on the collar itself, as you can see in the photos here. It's called a "hugging tag" because it hugs the collar. I like that because sometimes Shiner wakes me or the baby up if she shakes and her tags jingle around. Actually, the story behind Sophia Maxim Design comes from their beautifully designed tags. Appropiately named after two dogs - Sophie and Max - Dawn Grana, the Founder of Sophia Maxim Design, wanted a new way for her dogs to wear their tags safely and still look fabulous. Dawn's dog, Max, got his dangling tag stuck in her carpet one day and drug it across the room. He had to be cut free from all of the mess. Thankfully, Dawn was at home when it happened but who knows what could have happened if she were not. This story hit home with me because it has also happened to one of my best friend's dogs when she wasn't at home. My friend came home to find her dog stuck to the carpet after work one evening. Thankfully, her dog was OK but she became very careful in her collar and tag selection after the incident. The nice people at Sophia Maxim Design were kind enough to allow us to offer our readers a special discount code for 20% OFF through the entire month of April! Just use the special discount code "SMD1001" at checkout. 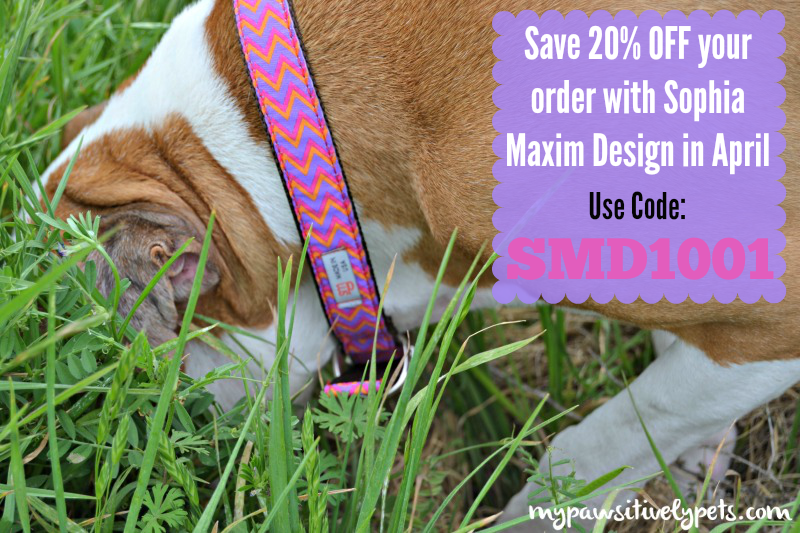 You can read more about Sophia Maxim Design and shop their full collection of beautiful dog collars, leashes, and tags at their website HERE. Is your dog's wardrobe ready for Spring? What is their favorite fashion accessory? No worries guys, I took it easy this weekend too. Shiner is rocking that gorgeous collar! That collar is perfect for Shiner! She looks gorgeous...and ready for Spring. Shiner that's just great! And I like that the collar has a real buckle and not only that plastic stuff. It's great to see such a cool design and not just paw prints on a collar. That collar was made for sweet Shiner! That is a very pretty collar. What a beautiful collar! I love the colors too.